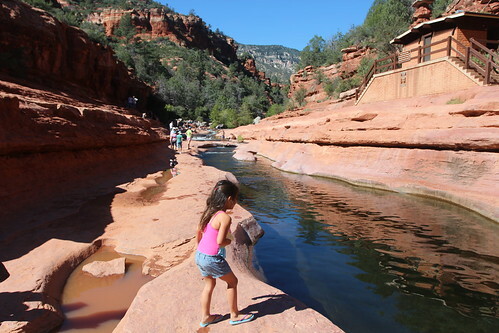 Mali Mish – Sedona, Arizona and Slide Rock State Park. We decided to give it a shot anyways this morning to see if maybe, just maybe, the rangers decided to keep it running for another day or two without pay. What do you think the chances are for that? Here is your answer: Fat. Fat chance. I never understood what that actually means. I know that it is used when the chances are slim to none. But why should the adjective ‘fat’ give the noun ‘chance’ the meaning of ‘slim to none’? I suppose this is a discussion for another post. 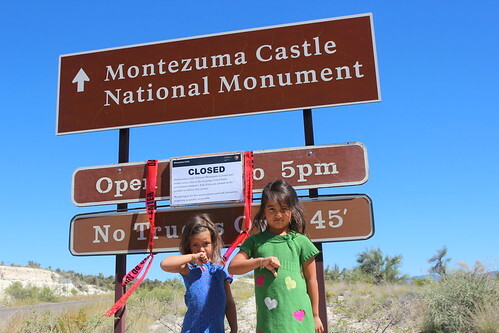 We had plans to visit lots of parks and monuments for junior ranger badges before we get to ABQ but now we are kind of up a creek without a paddle. ‘Up a creek without a paddle’… why does that phrase… nevermind. 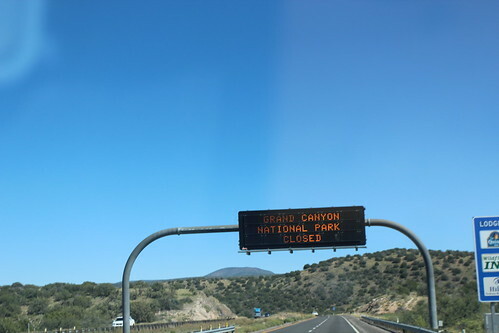 As we continued driving north towards Flagstaff, the government closure is now as clear as day and on full display all across the freeway. I feel bad for anyone who has been planning their vacation for months, maybe years, to have this happen right in the middle of their trip. We were not going to let this hiccup ruin our time in this area. 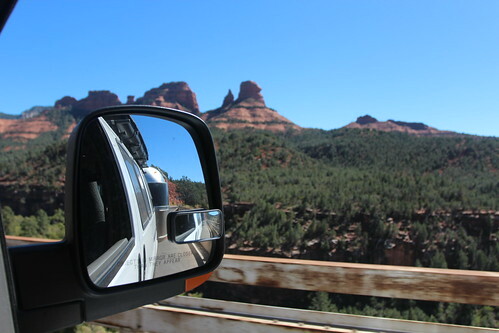 We made a last minute audible and turned west towards Sedona. 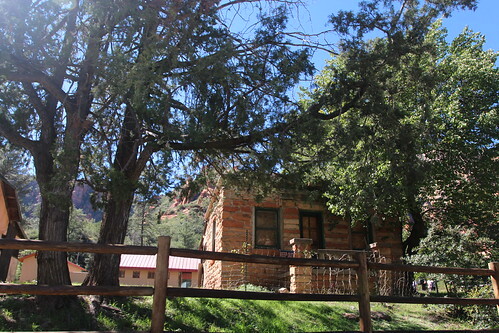 Sedona is an incredibly beautiful town. If there hadn’t been an established town in this region, it certainly would have been made into a National Park. 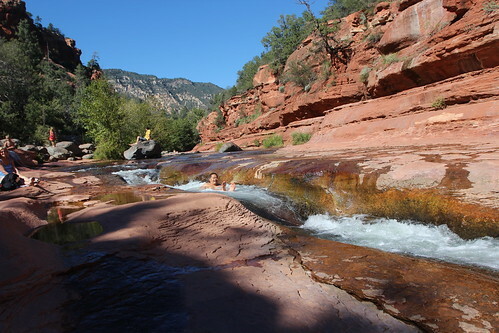 Many many years ago, Marlene’s parents took her and her brother out to Sedona on vacation and came swimming right at this spot. 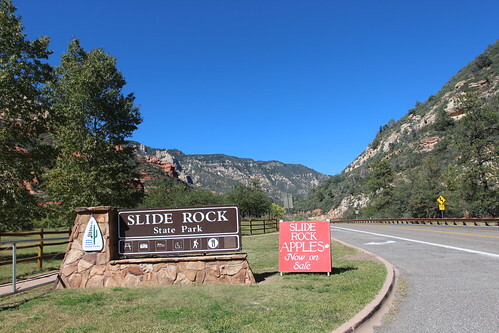 Slide Rock State Park. There is no camping here and our National Park Pass is no good but we are happy to have come here to spend the day. This land was first owned by a homesteader named Frank Pendley in 1907 who built a small cabin and irrigation ditches here for his apple orchard. 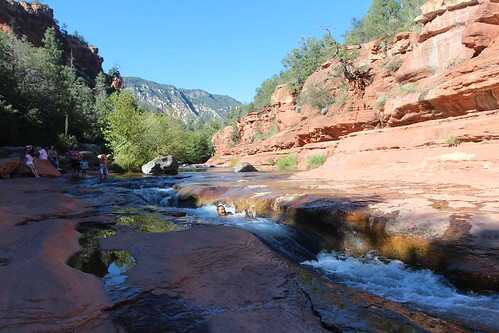 The nearby Oak Creek cut through the red rock walls and made a natural water slide. Even though we are here at the end of summer and the weather is relatively warm, the water is still very cold. Probably in the 40s Fahrenheit. That explains why there is hardly anyone in the creek. Since no one else wanted to brave the cold water, I had to be the guinea pig and give the natural water slide a shot. 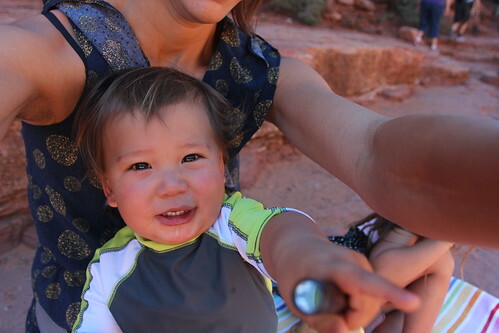 Luka thought it was very amusing as he points and screams, “Ma look!”. The rocks are slick and moves along pretty quickly. Once you get over the initial shock of the cold temperature, you are pretty much in for the ride. It was actually quite fun. Maybe if we could have been here a month earlier the water temperature would be different. 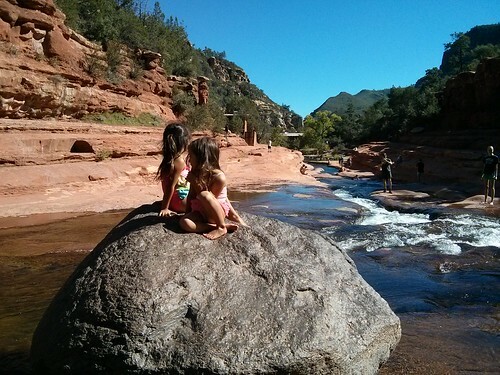 The girls enjoyed sitting on this rock in the middle of the creek looking like little mermaids. Yeah baby, that is cooooollllldddd…. Well, before we call it a day, I had to give this one more shot. Yep, it was just as cold as the first time. It takes your breath away for the first few seconds and the moment you get out of the water, you can feel your heart pumping blood through your body instinctively to warm it up. Yeah, these girls could not be talked into giving it a try. Maybe next time. As the sun moved behind the mountains, we made our way back to the Mish to make plans for our stop tonight. 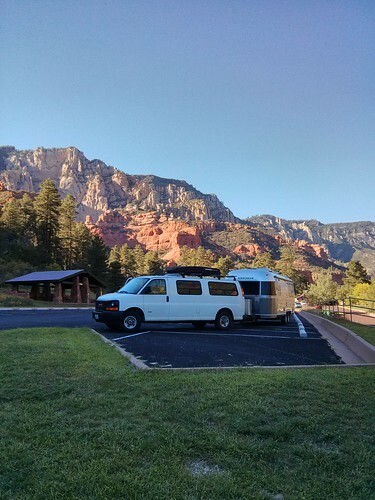 Without any National Parks or Monuments to visit, the plan is to head up to Flagstaff tonight and start making our way to Albuquerque tomorrow. 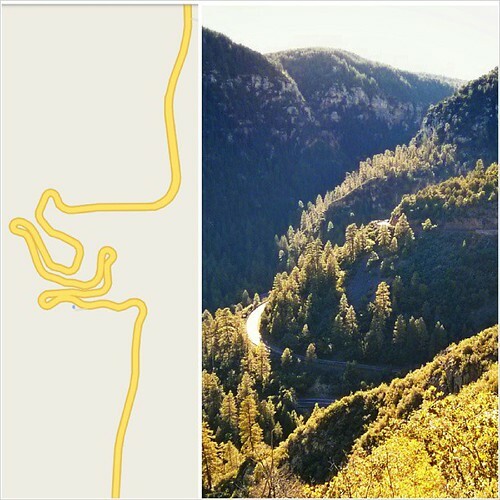 This is a section of the road that took us up the side of a mountain on the way to Flagtaff from Sedona. We did not know about these crazy switchbacks and steep climbs until we got there but we did make it to the top safely. 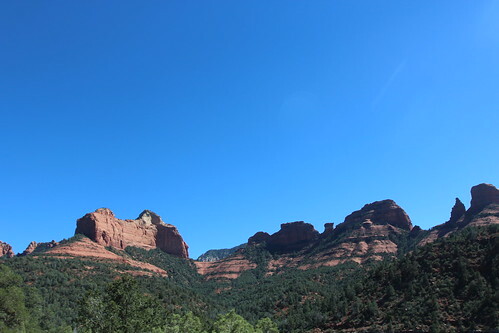 Here is the view from atop the road looking back down at Oak Creek Canyon. 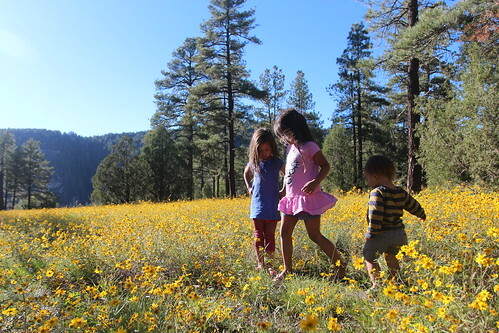 Our little scenic stop on the to of Oak Creek Canyon had a giant field of wildflowers that the kids posed in for a few photos. 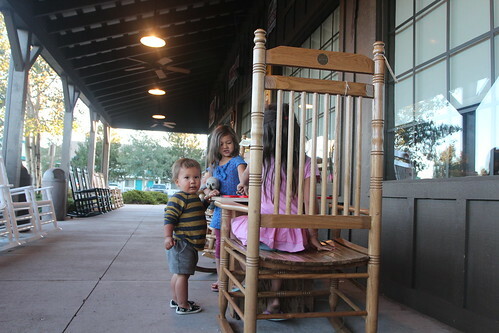 Tonight we will plan to stop at the Cracker Barrel in Flagstaff for dinner before continuing to make our way east. Who’s hungry for chicken dumplings? 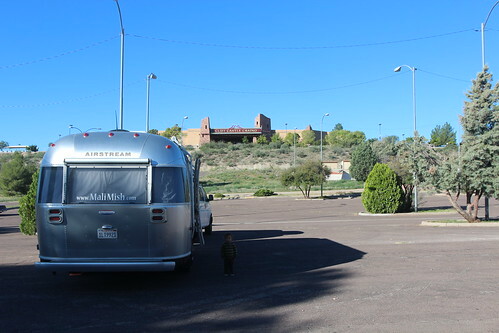 After dinner, we decided to take the opportunity to get some more miles under us and made it all the way for the night at the Walmart in Gallup, New Mexico. We should be in Albuquerque in just another night with lots of time to spare before the start of the Balloon Fiesta. 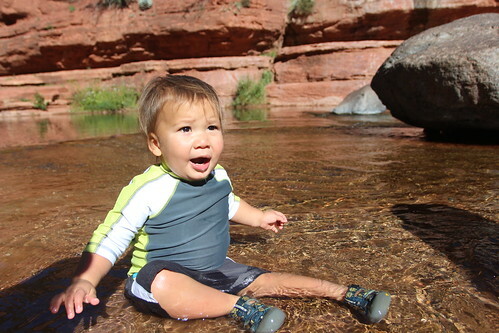 One Response to Sedona, Arizona and Slide Rock State Park. 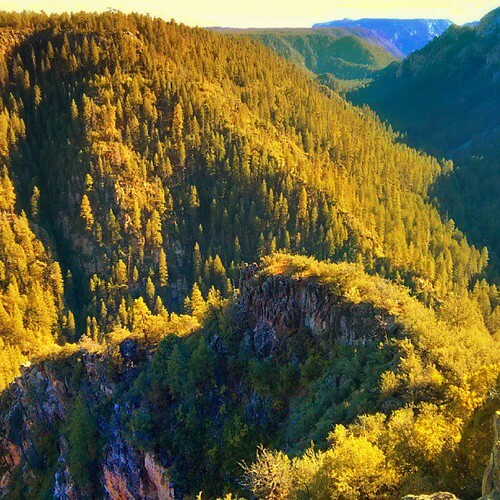 That park and Oak Creek Canyon are on my list for our next trip to Arizona. If you’ve not been, Chiricahua National Monument south of Willcox, AZ is a great trip for a few days. 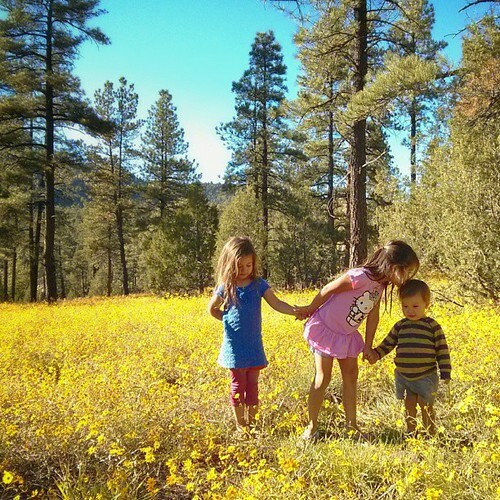 The campground is nice and there are some great hikes for all ages. Also, Cave Creek on the east side of the Chiricahua Mountains near Portal, AZ is good stop. An inviting creek to splash around in for the little one.